Roam Mobility is headquartered in Vancouver that aims to make U.S. roaming (on the T-Mobile network) easier for Canadians. Their voice and data plans are an option for those without unlocked devices and want to setup their roaming in Canada before they embark to the U.S.
For the month of October, Roam Mobility is offering a discount on their plans. For subscribers to their Talk+Text plans, adding data will only cost $2, making the cheapest option for prepaid wireless in the United States. 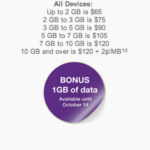 For example, those on the Talk+Text 30 day plan would get unlimited talk, text, 2GB of data for $2.07/day. 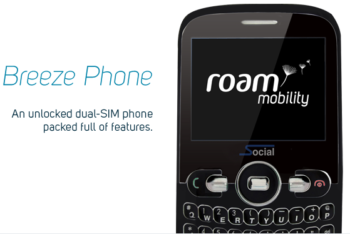 Another new device has been added to the Roam Mobility line up, a dual-SIM phone made by Social Mobile Cellular, the FB100. This quad band phone has a QWERTY keyboard, 1.3MP camera, and Bluetooth and headset with mic. It will be available for $49.95 including a Roam SIM card. There are cheaper ways to get roaming in the U.S. if you have an unlocked iPhone. But for those that want to have everything setup before they go in Canada, Roam Mobility is an option.